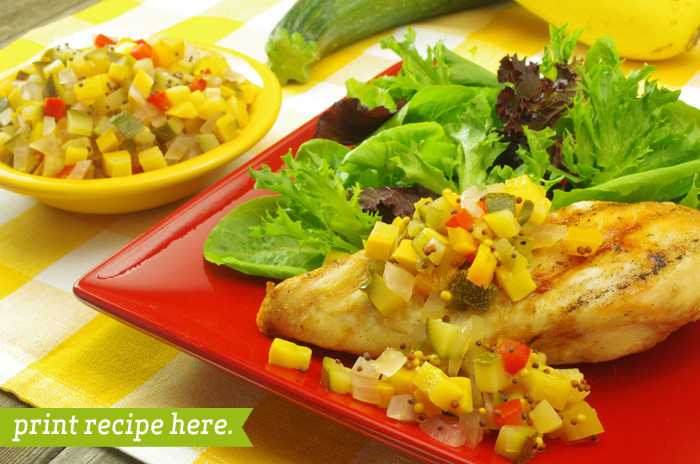 This is a recipe for the August garden, when squash and peppers are everywhere. 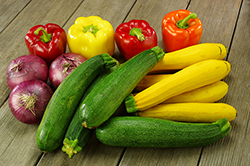 As long as you stick to the basic measurements, you can use any combination of zucchini, crooknecks, or pattypans and red, yellow, or green bell peppers. 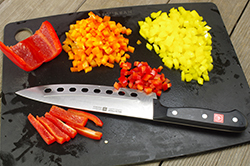 Diced by hand, the vegetables look like garden confetti. 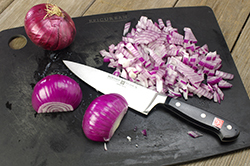 The chopping takes less time than you might fear, and probably not much longer than setting up, using, and washing a piece of kitchen gadgetry. 1. 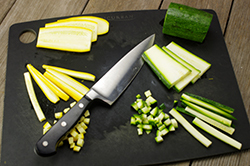 Chop the vegetables into 1/4-inch dice and toss with the salt. Set aside in a colander to drip for 2 hours. 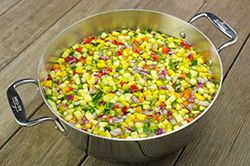 Pour a kettle of boiling water over the vegetables to rinse them. 2. 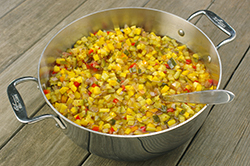 Combine the remaining ingredients in a large saucepan and bring to a boil. 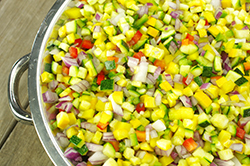 Add the vegetables, and cook over medium heat for 20 to 25 minutes, or until the vegetables are translucent and yielding. 3. 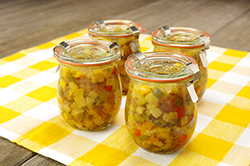 Pack the hot relish into five prepared pint jars, leaving 1/2-inch headspace. Seal the jars, and process in a boiling-water bath for 10 minutes. Allow to cure for a few weeks.